The trap that the overwhelming majority of biopics fall into is attempting to fit an entire life into a couple of hours. In doing so, these films tend to gloss over details, switch others around, and general contort and distort the messiness of real life into a simple three-act structure that in no way resembles reality, let alone the reality of the story being told. That's not to say that some lives don't fit such a structure, or that the structure is inherently flawed, but the overall approach tends to turn the lives of interesting, vibrant human beings into staid dramas full of self-importance. Crucially, they often fail to put across why the subject was important enough to deserve having their story told in the first place. Good biopics overcome this by finding an interesting angle. Walk The Line, which is one of only a handful of music biopics that is actually any good, works because it is as much about the relationship between Johnny Cash and June Carter is it is about their music, and this brings a humanity to the story that wouldn't be present if it was solely about the music, great though it is. Yet even the good films suffer from trying to cram too much in, and in the process wind up falling back on a handful of easy tropes to make the story digestible. It's a reductive approach that almost always leads to mediocrity. One of the many great things about Lincoln, Steven Spielberg's wonderful examination of the political acumen of the sixteenth President of the United States, is that it rejects this structure. Lincoln concerns itself solely with the last four month's of the President's life and the nerve wracking battle to get the Thirteenth Amendment, which permanently banned slavery throughout America, passed by Congress. There are no flashbacks to Lincoln's (Daniel Day-Lewis) poor childhood, no heavy handed attempts to show how insignificant events made him the man who lived and died keeping the Union together. The film begins in January 1865 and ends in April, yet by focusing on such a small window, it winds up revealing more about Abraham Lincoln as a politician and a man than a film with a wider scope could ever have hoped to. Now, a period film about legislative procedure might not sound like the most thrilling proposition, especially one where the outcome will be known by 99.9% of the people watching it, but Lincoln is first and foremost an entertaining film, one that moves with the speed and alacrity expected of one of the most naturally gifted storytellers in the history of the medium. The film takes its cue from Lincoln himself, who emerges as a funny, gregarious man who was as adept at telling a humorous story to lighten the mood or elucidate a point he wanted to make as he was at making grandly poetic speeches. Considering how important Lincoln was, it would have been easy to portray him as a ceaselessly serious figure constantly weighed down by the burden he had to shoulder, but this lighter - not to mention more accurate - portrayal is much more fascinating. Daniel Day-Lewis is not exactly renowned for being lighthearted, neither in terms of his work or the impressive (if occasionally tiresome) stories about his Method acting, but he completely subsumes his intensity to the requirements of the role. There's no trace of worthiness to his performance, no sense that this is an Important Actor tackling an Important Story, but rather a quieter, more reflective feeling that is more in keeping with the tone of the film. From the subdued, autumnal visuals to John Williams' unobtrusive yet beautiful score, everything is geared towards presenting Abraham Lincoln in a way which is unassuming, one befitting the humble, self-taught lawyer, but which also doesn't undersell his remarkable qualities. The moments that need to feel grand and important, such as Lincoln's impassioned plea to his cabinet to help him pass the Amendment before the end of the war, do have the appropriate weight to them, but because of the admirable restraint of all involved they have a greater impact. Whilst Day-Lewis is the centre that holds the film together, Spielberg populates the rest of the roles with a rogues gallery of great character actors, all of whom are on fine form. Seeing Ulysses S. Grant, Edwin Stanton and Preston Blair brought to life by the estimable likes of Jared Harris, Bruce McGill and Hal Holbrook helps build a rich and compelling world for the film, especially whenever they share the screen with Lincoln, allowing the audience to see how the President was able to balance all the disparate figures that he took into his confidence. The most purely enjoyable performances in the film come from James Spader, John Hawkes and Tim Blake Nelson, who play a trio of operatives hired to secure Democrat votes to ensure the passing of the Amendment. All three are a tremendous amount of fun as they partake in a caper contained within the main story, in the process enlivening the potentially dry scenes of people being offered jobs in exchange for votes, whilst also highlighting the difficult, dubious business involved in accomplishing great things. The only bum note comes from Joseph Gordon-Levitt as Robert Lincoln, Abraham's oldest son. Even here, the problem lies less with the performance than with the fact that the relationship between the two men is treated in a slightly offhand and superficial manner, which makes the tension between them seem grossly out of proportion. It illustrates how over-protective both Lincoln and Mary Todd (Sally Fields) were as parents who had already lost two sons, but it feels a bit rote and perfunctory. If there's an over-riding message to the film, it is one about the importance of compromise in order to achieve something for the greater good. The most heroic moment in the film comes when the radical anti-slavery Congressman Thaddeus Stevens (a bewigged Tommy Lee Jones) agrees to suppress his calls for full equality, knowing that his views are too extreme for the era and that if he voices them it could scare off moderates, scuppering the chances of passing the Amendment. One of his supporters confronts him about it afterwards, accusing him of betraying his beliefs, to which Stevens says that whilst abolishing slavery might only be a small step towards achieving what he actually wants, it is still a step in the right direction. At a time when the American political system has become so entrenched along party lines, this message of compromise and moderation resonates very strongly. Yet even in these moments, Lincoln never feels as if it is battering the audience with its message, but rather that the message emerges naturally from the story. Screenwriter Tony Kushner ensures that it is couched in great lines and strong characterisation, never letting authenticity become the victim of activism. 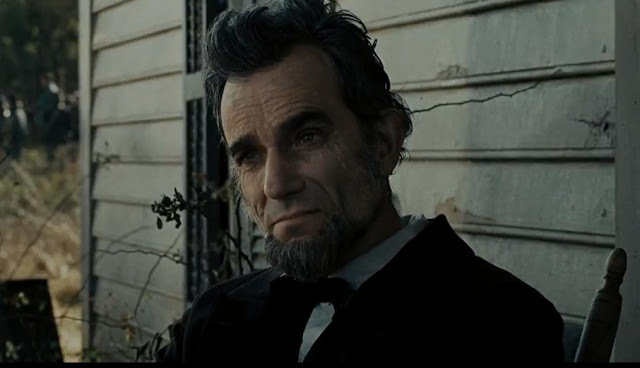 It's one of the many contradictions that makes Lincoln such a terrific film. It's a period film that feels vital and modern; a story about legislation that has the driving pace of a thriller; and an account of a legendary figure which is unerringly human. It's everything you would expect it not to be; funny, lively and hugely enjoyable. Leo Tolstoy once wrote of Lincoln, in a piece that is quoted at length in "Team of Rivals" by Doris Kearns Goodwin, the exceptional book upon which Lincoln is partly based, that “We are still too near to his greatness, but after a few centuries more our posterity will find him considerably bigger than we do." What Lincoln does, and does brilliantly, is that it shows the greatness of Lincoln by focusing on a relatively small part of it. As far as synecdoches go, it is a remarkably effective, and simply remarkable, one.